"With the three of us we need to use the camper and a tent, and in recent years they weren't allowing tents at Tetlanika because of wolves denning nearby coming into the campground... but when I went to reservations it went through". So that was all right then-except that I had already volunteered to sleep in the tent, to leave Steve and his wife Joan to enjoy the comfort and, now it would appear, relative security of their camper-van. Tetlanika was as far into the wilderness that is Denali National Park as private vehicles were allowed to go, and reservations for the camp-site were limited, so in broad terms this was good news. I just wish that the subject of wolves had not come up. However, I was soon to learn that bears rather than wolves were the most dangerous creatures to encounter in Alaska (Sarah Palin excepted). As far as reconnecting with Steve was concerned, within a few minutes of my arriving at Anchorage airport we had revived our old Brit v U.S. banter of 40 years ago, as though from the day before. We did not, in fact, see or hear a single wolf in Denali. However, we did see moose, beaver, caribou, dall sheep, arctic hare, eagles and, at a distance, grizzly bears, all amid magnificent wilderness scenery. Along the broad flat bottoms of huge glacial valleys were intricate braided river patterns. Barren, empty tundra rolled away towards towering snow-capped peaks. Such views reduced the inconvenience of heavy rain causing land-slides and flooding my tent into insignificance. The dominating presence was Mount Denali (McKinley). Clouds drifted around its massive peaks, occasionally tantalisingly parting to reveal at different times all its various parts, never the whole. I could see why this huge territory is regarded by so many as the last great wilderness. Nevertheless, the distant sight of brown bears had left me with a desire for closer encounters than the vast open spaces of Denali would permit, and so on our return to Anchorage (our departure precipitated by heavy rain penetrating my tent and soaking my sleeping bag) I swiftly made arrangements to fly to Brooks Falls in Katmai National Park, where bears come to feast on salmon returning upstream to their birth-place to spawn before dying. This involved taking a small plane over to the remote hamlet of King Salmon, from where a float-plane had to be taken to the falls. After the obligatory talk at the ranger centre about keeping safe around bears, visitors were allowed to wander off through the woods to the viewing platforms, trying not to feel too self-conscious about the clapping and shouting required to warn bears of approaching human presence. Most bear attacks on people occur when bears are surprised. Incidents on the tracks and trails in and around Anchorage, for example, generally involve swift and quietly moving runners and cyclists who suddenly run into bears and get badly mauled. My own closest encounter in the city was with a moose. I dismounted my bike to photograph her, unaware that she had calves concealed nearby. She became agitated and charged. Fortunately, this was merely a tactic to frighten me away. It worked! Thankfully, at Brooks, my 20 minute walk to the falls was uneventful. Emerging from the woods, I mounted a wooden walkway, and passed through a bear-proof gateway to the viewing platform by the falls. 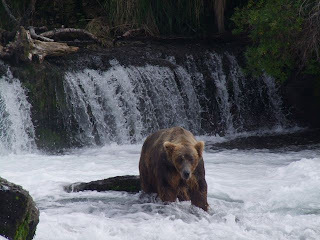 Along the foot of the falls, I saw several of the huge creatures, some almost motionless, concentrating intently on spotting the exhausted salmon struggling upstream, occasionally scooping up a plump victim in one deft, swift movement. Some of these grizzlies must have weighed close to 1000 pounds of muscle and bone, their power and dexterity impressive and intimidating. There were many other highlights. A strenuous hike past Exit Glacier up to the huge Harding Ice-field, another to the beautifully-situated Ptarmigan Lake, following a trail lined with a spectacular array of brightly-coloured wild flowers. Yet another hike,at Hatcher Pass, was alleviated by wild blueberries in fruit along the trail. Seals, sea-otters and sea-lions were only some of the wild-life observed cruising and kayaking in Resurrection Bay, out of Seward, experiences enhanced by viewing much of it up close in the in Seward's amazing sea-life centre. Even Anchorage was a revealation. It contained highways and stores like any other American city. But in the residential area gardens and forest ran into each other, so the one was indistinguishable from the other. Staying with Alaskans, I was able to meet locals who gave me insights into the state I would have missed on a normal tour. But it was clear that even these had not seen it all, not even the pilot who convinced me that its varied landscape were best seen from a light plane, a view I confirmed on my flight to Brooks Falls. I've only seen a small part of America's last frontier, but enough to realise that even with another lifetime in front of me there would always be something new and different around the next bend of the trail. My host's perspective on my visit can be viewed on his blog.